Definition at line 35 of file face-event-notification.hpp. Definition at line 34 of file face-event-notification.cpp. Definition at line 39 of file face-event-notification.cpp. Definition at line 46 of file face-event-notification.cpp. References ndn::tlv::nfd::FaceEventKind, ndn::tlv::nfd::FaceEventNotification, ndn::tlv::nfd::FaceId, ndn::tlv::nfd::FacePersistency, ndn::tlv::nfd::FaceScope, ndn::tlv::nfd::Flags, ndn::tlv::nfd::LinkType, ndn::tlv::nfd::LocalUri, ndn::nfd::FaceTraits< FaceEventNotification >::m_faceId, ndn::nfd::FaceTraits< FaceEventNotification >::m_facePersistency, ndn::nfd::FaceTraits< FaceEventNotification >::m_faceScope, ndn::nfd::FaceTraits< FaceEventNotification >::m_flags, ndn::nfd::FaceTraits< FaceEventNotification >::m_linkType, ndn::nfd::FaceTraits< FaceEventNotification >::m_localUri, ndn::nfd::FaceTraits< FaceEventNotification >::m_remoteUri, ndn::encoding::prependNonNegativeIntegerBlock(), ndn::encoding::prependStringBlock(), and ndn::tlv::nfd::Uri. Definition at line 67 of file face-event-notification.cpp. References ndn::Block::hasWire(), and ndn::nfd::FaceTraits< FaceEventNotification >::m_wire. Definition at line 83 of file face-event-notification.cpp. References ndn::Block::elements_begin(), ndn::Block::elements_end(), ndn::tlv::nfd::FaceEventKind, ndn::tlv::nfd::FaceEventNotification, ndn::tlv::nfd::FaceId, ndn::tlv::nfd::FacePersistency, ndn::tlv::nfd::FaceScope, ndn::tlv::nfd::Flags, ndn::tlv::nfd::LinkType, ndn::tlv::nfd::LocalUri, ndn::nfd::FaceTraits< FaceEventNotification >::m_faceId, ndn::nfd::FaceTraits< FaceEventNotification >::m_facePersistency, ndn::nfd::FaceTraits< FaceEventNotification >::m_faceScope, ndn::nfd::FaceTraits< FaceEventNotification >::m_flags, ndn::nfd::FaceTraits< FaceEventNotification >::m_linkType, ndn::nfd::FaceTraits< FaceEventNotification >::m_localUri, ndn::nfd::FaceTraits< FaceEventNotification >::m_remoteUri, ndn::nfd::FaceTraits< FaceEventNotification >::m_wire, ndn::Block::parse(), ndn::encoding::readNonNegativeInteger(), ndn::encoding::readString(), ndn::Block::type(), and ndn::tlv::nfd::Uri. Definition at line 61 of file face-event-notification.hpp. Referenced by ndn::nfd::operator<<(), and ndn::nfd::operator==(). Definition at line 158 of file face-event-notification.cpp. 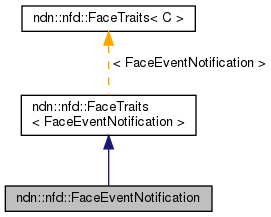 References ndn::nfd::FaceTraits< FaceEventNotification >::m_wire, and ndn::Block::reset().